We escaped the Mardi Gras madness this week and headed to my parents' house for the day. 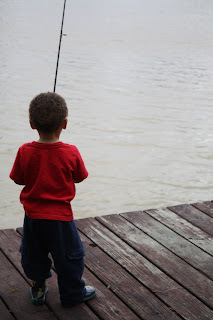 Although the weather was kinda yucky, Silas had lots of fun fishing with his Papa and jumping in the mud puddles. Click on the picture below to see the entire album. P.S. Keep reading. The post below is my latest pregnancy update!